Austere and weather-beaten, Graves Light might appear to the uninformed observer to be a more ancient structure than Boston Light, its neighbor in Boston's outer harbor. Surprisingly, it's actually one of Massachusetts' youngest lighthouses. In 1843, the engineer I.W.P. Lewis expressed surprise that there was no beacon on the ledges known as the Graves. The ledges were named for Rear Adm. Thomas Graves, who came to America from London in 1628 and was an early settler of Charlestown, Massachusetts. The ledges, about 4.5 miles from the mainland, stretch in a southwest to northeast direction. At high tide, most of the ledges are submerged. An iron bell buoy was placed near the ledges in 1854. It was later replaced by a whistling buoy beyond the northeast end of the ledges. A new major shipping channel into Boston Harbor, the Broad Sound Channel, opened in the early 1900s, necessitating a lighthouse at the Graves. The best location was the extreme northeast ledge of the group, but it was too small for construction. The site chosen was about 2000 feet from the northeastern extremity. In 1902, Congress appropriated $75,000 for a lighthouse and fog signal, and Governor Crane of Massachusetts signed a deed conveying 435,400 square feet at the ledges to the federal government. The project ultimately cost $188,000, meaning a second appropriation of $113,000 was required in April 1904. Construction took place from 1903 to 1905, and Royal Luther of Malden, Massachusetts, was in charge. 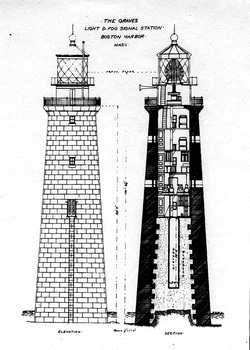 The style of Graves Light is very similar to Maine's Ram Island Ledge Light, built at about the same time. 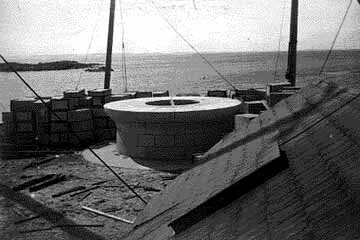 Below: Scenes from the construction of Graves Light. From the collection of Edward Rowe Snow, courtesy of Dolly Bicknell. The granite for the tower was cut at Rockport on Cape Ann. Rock on the ledges was blasted, and the foundation was laid just four feet above the low tide mark. The first 42 feet were completed in the summer of 1903. A schooner transported materials from Lovell's Island, 3 1/2 miles away, to the Graves, and a 75-foot steamer transported workers to the site. A shanty was constructed on the highest ledge of the Graves, connected to the wharf by a 90-foot elevated walkway. The shanty had living quarters, a storeroom, a blacksmith shop, and a kitchen, and up to 30 men lived there in the summers of 1903 and 1904. While the granite was being put in place, the ironwork was being manufactured in Boston and a huge first-order Fresnel lens was being created in Paris. The summer of 1904 saw the lighthouse reach a height of 88 feet. Construction was completed during the following year. A granite oil house was built 90 feet south of the tower, reachable by a footbridge. On the night of September 1, 1905, Graves Light's first keeper, Elliot C. Hadley, lighted the most powerful light in Massachusetts history for the first time. 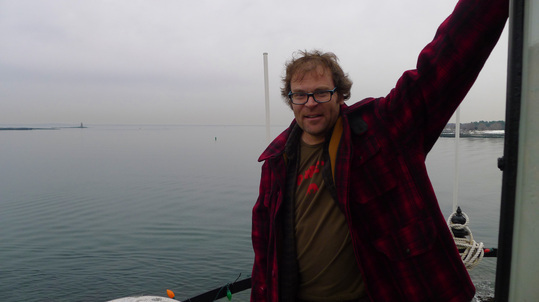 The gigantic lens floated on 400 pounds of mercury. At so exposed a site the height necessary for the lantern above the heavier masses of spray, the consequent geographic range, its location so far seaward, the service of the light to the large commerce of Boston and modern ships of deep draft, make it perhaps the most important light north of Cape Cod. And guides to the haven, Thou welcoming Graves. When it went into service, Graves Light was measured at 380,000 candlepower. The light was later upgraded to 3.2 million candlepower, and for many years it was the most powerful light in New England. The station was also equipped with a powerful Daboll fog trumpet. It was reported that 882 granite blocks went into the construction of the tower. The tower is just over 30 feet in diameter at the base, and the lower stones -- held to each other with strong bolts -- are 7 feet thick. 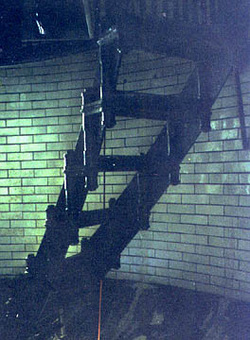 The lower 42-foot section of the tower was filled with concrete, with a space left for a cistern. The entrance door to the tower was at the top of a 30-foot ladder, which made entry difficult in rough weather. The first story was the landing and storage space, the second was the engine room containing the fog-signal equipment, and the third floor was the kitchen. The fourth and fifth levels contained the keepers' beds and a library. Handgrips were built into the outside of the lantern, which made the treacherous job of cleaning the outside of the glass a little easier. Two of the floors and all the walls were finished with enameled bricks. The handrails on the stairways were mahogany, and the rest of the woodwork was oak. Left: The tiled wall can be seen behind the stairs to the lantern room. A newspaper article described the rooms in the lighthouse as "reminiscent of cheery, compact little cabins on a smart steamer." The cistern in the bottom of the lighthouse was filled with water twice yearly by a lighthouse tender, and food was delivered regularly to the lighthouse. The keepers augmented their diet with lobsters caught in their own traps around the ledges. Right: This photo showing the rocks at the Graves covered with ice was published in the Boston Post in February 1934. From the collection of Edward Rowe Snow, courtesy of Dorothy Bicknell. I've looked up at solid water rushing in toward the ledges. I don't know how far up the solid water comes. I've been knocked down by it on the wharf beside the light, and opening a window to look out more than halfway up the tower, I've had as much as three buckets-full dashed in my face. A severe storm in November 1935 moved giant stones, some weighing three tons, and deposited them near the lighthouse. Several wrecks have taken place in the vicinity of Graves Light. In 1938, the 419-foot freighter City of Salisbury, remembered as the "Zoo Ship" for its cargo of zoo animals, struck a reef not far from the Graves. There was no loss of life. The ship became a tourist attraction for a few months before it finally split in two and sank. Left: First Assistant Keeper George H. Fitzpatrick, left, and Keeper Octavius Reamy, right, on October 1, 1935, the 30th anniversary of the lighting of Graves Light. From the collection of Edward Rowe Snow, courtesy of Dolly Bicknell. The last civilian keeper, Llewellyn Rogers, also was at the Graves when the steamer New York crashed into the Romance. The Romance sank in 20 minutes, but no lives were lost in the disaster. In 1947, Graves Light served as a filming location to a movie crew working on the David O. Selznick production, Portrait of Jennie, starring Joseph Cotten and Jennifer Jones. Circa 1940. Courtesy of Dorothy Bicknell. Graves Light was supposed to be an abandoned Cape Cod lighthouse where Cotten's character went to paint in solitude. The climax of the film takes place on the ledges around Graves Light with Cotten looking for his lost love, Jennie. The crew spent 10 days in and around the lighthouse. Historian Edward Rowe Snow, a resident of nearby Winthrop, served as a goodwill ambassador to the movie crew. Left: Film clip of actor Joseph Cotten with historian Edward Rowe Snow during the filming of "Portrait of Jennie." 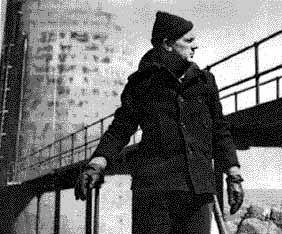 Above: Joseph Cotten at Graves Light. Coast Guardsman Larry Bowers was stationed at Graves Light from 1961 to 1963. He later recalled one storm when waves knocked out the window on the first deck and destroyed the generator. He also remembered a summer visit from Edward Rowe Snow, who gave him a copy of his book Famous New England Lighthouses. There were problems in the 1970s with the mercury that served as a bearing for the rotating lens. I was the last Coast Guard keeper of the Graves Light. I was there for two tours of duty -- I closed it down the first time due to a mercury spill, and after the light was decontaminated I went out for another year. Right: This photo, taken on July 5, 1941, shows Keeper Llewellyn Rogers in the doorway greeting visitors to the lighthouse. Courtesy of Dorothy Bicknell. The light was automated in 1976. The Fresnel lens, 12 feet high and nine feet in diameter, presently sits in storage at the Smithsonian Institution. For a period between 1981 and 1983, the light was powered by an emergency generator due to damage to the electrical cable from shore. Left: This photo of the American flag flying at Graves Light is courtesy of the last Coast Guard officer in charge, Pedro Marticio. We aboard the U.S. Coast Guard Cutter White Heath had to fuel it every five weeks. We could always tell if we didn't get there in time because it was reported as an outage. Sometimes the seas were too rough to make a landing to fuel. On Christmas Eve of 1984, the light failed. A Coast Guard Aids to Navigation team headed out to the lighthouse and got the light back on. They just beat a bad storm back into Boston. The team's officer in charge, Chief Paul Driscoll, said "four guys almost spent Christmas night in a lighthouse instead of home with their families." Storms and vandalism have done their share of damage. The old walkway has been destroyed by storms, and vandals have caused thousands of dollars in damage. The fog signal house was swept away by the "Perfect Storm" of October 1991. The badly damaged landing platform was repaired in 1993. The original oil house still stands. The submarine cable from the town of Hull that powered Graves Light was damaged in a March 2001 storm. Three months later, the light was converted to solar power. A civilian crew working for the Coast Guard out of South Portland, Maine, did the job. The conversion ended the light's reliance on the submarine electrical cable. I shall not attempt to give you a description of the scene from the top of the Light but hope that some day you may journey to this far-flung ledge and see the splendid view for yourself. The lighthouse was sold in a government auction in September 2013 to Boston businessman David Waller. The selling price was $933,888, more than twice the highest amount previously paid for a lighthouse at auction. There is a website for the lighthouse at graveslightstation.com. You can get excellent views of Graves Light from various tour boats, as well as distant views from the towns of Winthrop, Nahant, and Hull. Left: Today, Coast Guard crews working at Graves Light usually arrive by helicopter, landing on a small platform next to the tower. The crew that converted Graves Light to solar power in 2001, L to R: , Electrical Work Leader Fred S. Eggleston, Maintenance Mechanic Craig Smith, Electrician Al Wilson, Carpenter Work Leader Hugh Hicks, Helicopter Pilot Dale Hardy. The project was supervised by Chris Ledwith. Dave Waller, owner of Graves Light, in December 2013. Right: A 2014 commercial for Harvey Building Products, featuring Graves Light. Elliott C. Hadley (1905-1911); Elliott C. Hadley, Jr. (second assistant, 1908-1912, first assistant,1912-? ); Robert M. McAfee (second assistant, 1906-1907, first assistant, 1907-1912); Thomas J. Creed (second assistant, 1909-1910); George L. Lyon (1911-? ); William Anderson, Jr/ (second assistant, 1912-? ); Henry Towle (c. 1914-1917); Benjamin S. Bassett (second assistant, ?-1914); Harry Whin (second assistant, then first assistant, c. 1916-1917); John A. Strout (second assistant, 1915-1916); William A. Baldwin (second assistant, 1916-?); ? Carter (c.1917-1924); Octavius Reamy (assistant 1906-1907, keeper 1924-at least 1939); Allison Gregg Haskins (c. 1920s); Llewellyn Rogers (c. 1930s-1940s); George J. Fitzpatrick (first assistant, c. 1935); Osborne Hallett (assistant, 1937); Otis Earl Walsh (assistant, c. 1940); Ernest A. Sampson (U.S. Coast Guard, 1943-1944); Raymond Burton (U.S. Coast Guard, c. 1945); Bernard Brady (Coast Guard, c. 1945); Robert H. Curran (U.S. Coast Guard, c. 1945); Charles Sidney Martin (U.S. Coast Guard, c. 1950); Gene Calmon (U.S. Coast Guard, 1952); ? Delany (U.S. Coast Guard, c. 1961); Larry Crouse (U.S. Coast Guard, 1961); ? Newman (U.S. Coast Guard, c. 1961); John Mariani (U.S. Coast Guard, c. 1961); ? Cookson (U.S. Coast Guard, c. 1962); Larry Bowers (U.S. Coast Guard, 1961-1963); Stephen Downey (Coast Guard, c. 1967), Edward Widborg (U.S. Coast Guard, c. 1966-1967), ? Butler (U.S. Coast Guard, c. 1966-1967), Allan Leto (U.S. Coast Guard, c. 1968), James Kreiger (U.S. Coast Guard, c. 1968), Pat Faiella (U.S. Coast Guard, c. 1970), Douglas Smart (Coast Guard, c. 1971), Sheldon Kaminsky (Coast Guard, 1970-1971), Pedro Marticio (?-1976).